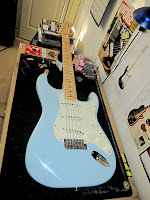 My last post stated that I had no other mods planned for my Sonic Blue Malmsteen Strat, but that changed once I decided to take the plunge and order a couple of Callaham Strat tremolo replacements. 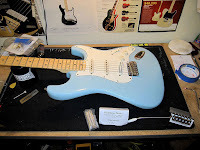 I had heard of Callaham guitar parts (especially their Strat trems) for years but for one reason or another I never got around to buying one to try out. 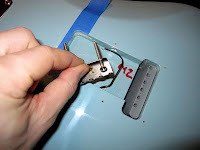 Now that I am much more handy with guitar repair and modification I am able to do simple things like swapping a bridge out without a problem, which makes it much easier (and cheaper) to try different things to see if they really do improve the instrument. All I can say about this product is WOW! What an incredible difference in tone from the original bridge. 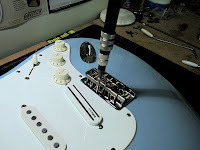 Callaham bridge parts are all machined by hand in-house and are made from quality cold rolled steel and other alloys that truly enhance the tone and vibration transfer from the strings to the guitar. 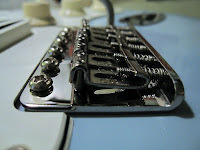 The quality is quite apparent when handling the trem itself. All the screws fit snugly and thread in effortlessly... it is easy to tell the metal and machining is of higher quality than the standard Fender fare (even all the screws supplied with the bridge kit are made of hardened steel with heads that are much less likely to strip out; which, by today's standards, is quite rare and wonderful!). I immediately heard the difference in both the plugged in and unplugged tone of the guitar. 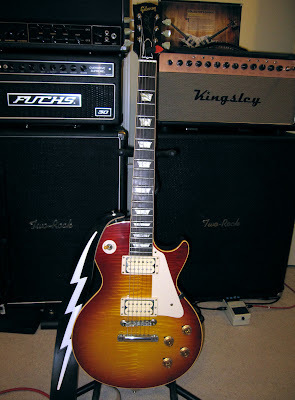 The overall tone is brighter and much louder than before. Definitely more musical and richer. Unplugged the guitar is perhaps 30% louder than before, and plugged in it has a longer natural sustain and a gorgeous "classic Strat" tone that has equal parts "spank" and "fatness". 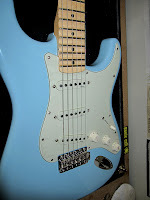 A big problem with Malmsteen Strats (and many other Fender Start models) is the wide string spacing of the vintage tremolo combined with overly dressed fret ends. 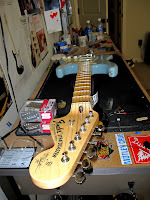 The low and high E strings tend to slip off the edge of the neck when playing. Very annoying! 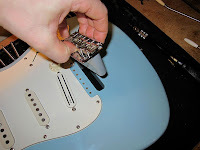 Well, I solved this by ordering the Callaham replacement bridges with vintage 2 7/32" (56mm) mount spacing but with the narrow 2 1/16" string spacing (normally found on modern, two-point Fender trems). This helped bring the E strings back from the edge... the guitar now plays like normal with zero slippage! I couldn't be happier with the result. I give these bridges my highest rating!! !